Ever heard of Agar? It’s a red sea vegetable that takes the place of gelatin in this easy recipe making it a vegan alternative to regular jello. Agar, also know as Kanten in the East, is very good for the digestive track, high in iodine, calcium and phosphorus. By heating and then cooling Agar, it works as a gelling agent in jello, jellies and puddings. So loose the pre-packaged brand and try this simple recipe. Bring juice to a boil over medium heat. Whisk in the agar powder until completely disolved and let simmer for a few minutes. Pour into a glass dish or jello mold and let cool until set. Agar does not need to be refrigerated to set, but it will speed up the process. Double or triple the recipe to make a bigger batch and make it more fun for kids by letting them help you cut it into jiggly shapes! 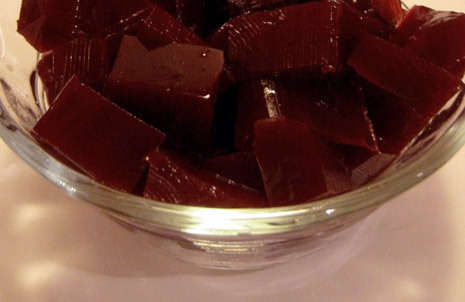 I love the idea of black cherry jello that is good for your digestive system. Wikipedia says it is 80% fiber.